This weekend I will be getting back into the woods of Fort Wilderness. This was my boyhood home when at Walt Disney World, and while I have never passed up a chance to grab some chicken, sing some songs by the campfire, or just sit on the shores of Bay Lake listening for the motor launches to come in, it has been well over fifteen years since I’ve actually stayed there. It’s an experience that I am very much looking forward to, even if Fort Wilderness isn’t the place I remember. When I was a child, it was a different age. My sister and I, and occasionally a pair of cousins who would meet us there, were given run of the campground provided we were cautious and polite. We would take our Huffy bikes, I’m still convinced that the black and red design gave my bike an edge in the speed department, and head up to the Meadow Swimming Pool for a dip or a zebra cone. A zebra cone, for those of you not in the know, is what they called an ice cream cone with swirls of chocolate and vanilla soft serve. We would find kids to play tetherball with or to set up fake battles at the playgrounds with. It is worth noting that the playgrounds at that time had wooden forts with interlocking beams and metal teepees all over the place. Also, metal teepees, in the Florida sun, I’m sure we all burned ourselves at least half a dozen times before we learned not to touch or lean up against them. Biking up to the trading posts was also not uncommon, even if just for some window shopping of all the cool items for sale. Especially the post cards, I love the post cards. Come sundown we would find a stick around our campsite and head to the sing-a-long with our parents. After consuming a godawful amount of marshmallows, I would be thrilled to belt out my rendition of My Bonnie and wait, impatiently, to give Chip a hug. Then we would settle in for a viewing of Peter Pan, The Great Mouse Detective, or 101 Dalmatians. Some nights we would venture over to the Settlement to pay our respects to the Lawnmower Tree and to grab some sand for the Electrical Water Pageant. Late into the night we would sit around our campsite, complete with a tarp canopy and plastic colored lanterns strung between the trees, and play cards and nibble on some fudge my aunt picked up at the trading post. I should mention we were a resourceful lot. My father had a large, white conversion van for work that had two bucket seats in the front and enough space in the middle to set some crates to make it look as if my sister and I were on a bench seat. When we got close to Walt Disney World we would tune into the AM station broadcasting all the Disney information you needed to know and my sister and I would cover our laps with a blanket so that the person at the entrance plaza didn’t think twice that we weren’t buckled in. Like I said, it was a different age. Oh, and we definitely got to drive the golf cart a time or two (or ten…). 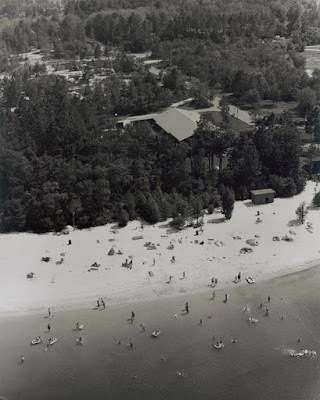 In those days you followed painted lines on the road to your resort, and you only had the Contemporary, Polynesian, or Fort Wilderness to choose from. It was a miracle to see a motorhome anywhere near the campgrounds, we always stayed on Jack Rabbit Run, upon arrival you always tried to find the trail behind your campsite that led to make believe adventures and the Comfort Stations, which were a common meeting spot for whatever gang of well-mannered hooligans we were able to corral that week. So, what’s changed? Why has it taken me so long to return for a stay at the place I love so much in the world? I can’t tell you for certain. Sure there have been some safety improvements over the years. The underbrush between sites has been cleared away, Comfort Stations require key card/wristband access overnight, and playgrounds are no longer the metal and wood death traps that once inspired daredevil antics. Now tent camping is almost as rare as motorhomes were in my day, and the cost for a spot on Jack Rabbit Run is almost equivalent to a night in one of the All-Star or Pop Century resorts. River Country has been closed for fifteen years, the Lawnmower Tree lost its battle and all but rotted away, and the remnants of the Fort Wilderness Railroad have all been lost to time. That being said, they have Segway tours now and the Meadow Swimming pool has a water slide and a splash and play zone. But nothing here tells me why I haven’t been back. I understand and respect change in Walt Disney World, especially when it is painful for me to watch something I love go away. I cherish the memories of am extinct place or show a little more, and talk about it with a bit more sparkle in my voice. Change is the way of the world, and I would hate for my children to inherit the same Walt Disney World I grew up with. I can’t explain why I’ve stayed away for so long, which means all I can do is head back to Fort Wilderness as quickly as I can. This will be a different trip for me though. We won’t be in a tent, we’ll be roughing it cabin style. It’s a rough life, I know. I’ll be piloting the golf cart legally this time, and there aren’t likely to be many self-exploring bike rides, although some exploring walks may be in order. 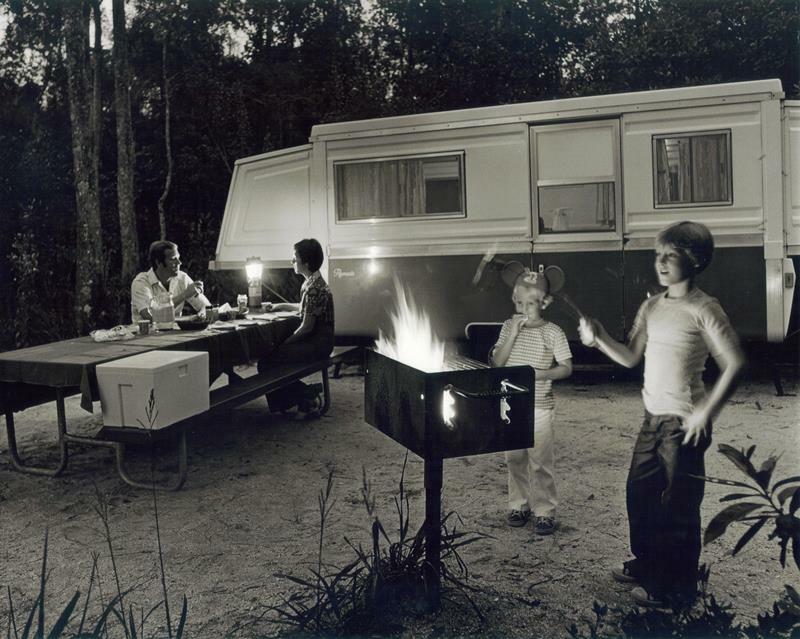 This will be my wife’s first stay at Fort Wilderness, which means she’ll spend just as much time reigning in my exuberant storytelling of days gone by as she does relaxing and enjoying the woods, pools, and campfires. I’m looking forward to visiting with Chip, checking in on the seas serpent of the Electrical Water Pageant, grabbing some fried chicken, and soaking in the smell of the Meadow Trading Post. And all of that will only be in the first twelve hours! I can’t go home again, it’s isn’t the same place I left, but maybe it’s a different home for me now and just what I need at this age in my life. Only time will tell. I’ll be sure to share my adventures as we go along! I wonder if anyone taped those AM radio announcements.